I never doubted what God spoke to me prior to this particular situation. I always stood confident in His promise and owned it as if the words were tattooed on my torso. But this one was different. My situation didn’t look like what God had spoken. It didn’t feel like it after a while either. The promise God whispered to me felt miles away. Though He equipped me with affirming words to confirm what He spoke, I just couldn’t believe it — not with the way my situation was looking. I’d grow to question my discernment, my faith, and my closeness to God. Nothing made sense. It felt like this wonderful promise God made would never come to fruition. Either I misheard, or God lied. I couldn’t deal with being confused about this. I had dedicated years to operating in alignment with what God had spoken to me, only for it all to come crashing down. What was I without discernment? What was God without truth? The journey toward God’s promise was no where near over — there was still plenty of time for God to show Himself — but in my head, it might as well have been the end. Dealing with this level of spiritual confusion and doubt, I turned to people to interpret what God spoke to me. I sought after pastors and ministry leaders sharing with them my situation and the messages I had received from God over the course of 3 years. I looked to them to dissect and correct (or confirm) what I had heard. Things didn’t seem to be playing out the way God made me believe they would — or at least not in the way I expected them to. I was growing weary, doubtful, and my faith was fading...fast! I needed someone to tell me I was right and that God will work it out — or to tell me I was wrong and point me in the right, more realistic, direction. But no one could offer that support, because no one could tell me what God spoke to me. No one could confirm or validate what God said. There was no on-call prophetess I could connect to. I grew even more devastated knowing that I was alone to figure it all out myself. I was operating all wrong. God had already confirmed His promise, and He refused to offer any additional validation from man. I’m sure He was offended that I would even go that route; valuing the words of mortals over His omniscient truth. After having failed at finding someone who could make sense of it all, I realized that I had to ground myself in what God already said — whether my situation looked like what He said or not. That’s faith: believing in what’s to come despite what’s happening now. “The substance of things hoped for, the evidence of things not seen.” I didn’t have much [faith] left, but I knew all I needed was a little — mustard seed faith. I clenched on to that little bit. I held on to it with dear life, when the enemy returned to sow seeds of confusion and doubt. I held tighter when I began rejecting God’s promise itself, telling Him I didn’t want it anymore. I worked diligently, and am still working, to hold onto the faith I’ve developed for this promise that doesn’t look possible. I’ve been digging my feet into the dirt and grounding myself in God’s truth. It hasn’t been easy, but I’m trusting that it’ll be worth it. So how do you — faithful servant, woman of God, person in doubt — ground yourself in His promise despite what your situation looks like now? Dharius Daniels said it beautifully, “so many of us think we know God, just because we know His name.” That becomes evident the minute we experience spiritual turmoil. Knowing God is beyond being able to identify His presence, it’s about being able to identify His personality. Understanding that God is not a man that he should lie, I had to trust that His promise would come to pass. God will not change His promise for our lives just because we don’t believe it. He said what He said and He meant it. In recognizing this, I learned to trust the way it would come to pass. It would not be the way I envisioned it — a linear path of happiness and clarity. It would very much be ups and downs, but those ups and downs wouldn’t prohibit it from happening. If anything, it was evidence that it still would. God wanted me to rely on Him — He wanted me to trust Him — and had the path been straight, I wouldn’t have to. God never let me down; He’s proven time-and-time again that His outcomes are always better than what mine would have been; His track record is good and His power is mighty. Knowing and understanding this, helped me re-center myself back to His promise. It’s so easy to shy away from God during moments of confusion and doubt. However, it’s detrimental that we fight that urge. It’s important to stay aligned with God no matter what our situation looks like. Remain obedient. Remain hopeful. Stay in faith. Keep speaking His promise over your life especially when you’re most doubtful. Stay on His path, and trust the journey He’s taking you on. 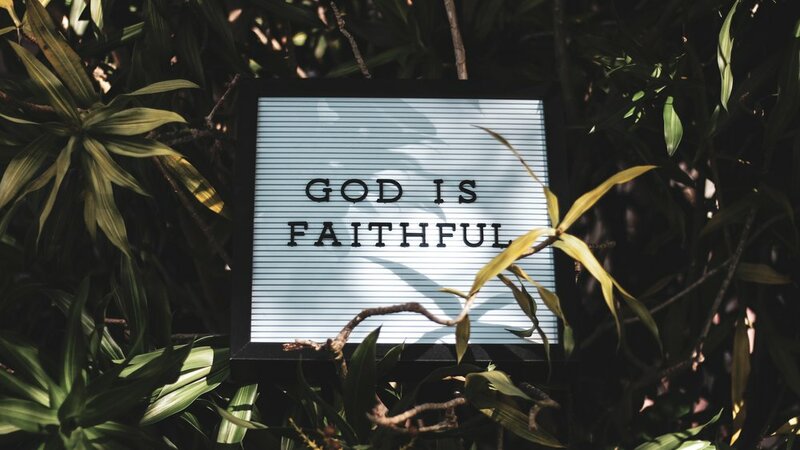 It won’t always be favorable, but His promise won’t fail — and it’s better for you to remain in position and be ready for it, than to prolong it because you weren’t prepared. God is going to do exactly what He said He would, but you must be in a position to receive it. Don’t step out of line and miss your blessing. Don’t forfeit your deliverance because of your disobedience. Though the journey may not be ideal, it’s important to know that your closeness to God will get you through. He will comfort you in every bit of pain you may experience on account of this journey, if you allow Him to. Draw nearer to Him and let Him do that work in you and for you. Rely on Him to bring you peace and clarity in the middle of your situation. That’s what He’s promised you, and that’s what He’s there for. I don’t know everything. But God does. And if all He’s asking me to do is trust Him then that’s exactly what I plan to do. I don’t need confirmation from anyone else — nor do you. Stand in faith, ground yourself in His promise, and watch it all unfold before you.